True confession: While I feel I have made up for my lack of grace with enthusiasm and effort, so far I haven’t been especially coordinated on the skis. I’m not the strongest skier in the world, and a lot of my time up until this point has been spent learning how to turn and how to not be afraid of going over the tiny bridge to Pike Island and to not fall down so much. Maybe the Loppet infused me with a newfound confidence. Maybe I caught some kind of competence virus or osmosed some skills from the other skijorers. However it happened, the Mush Puppies and I were out earlier this week and I’m feeling a lot more comfortable on the skis. They’re starting to feel a lot less like twin balance beams of precarious doom and a lot more like inoffensive extensions of my body under my own control. And as I get more comfortable, I get more coordinated, smoother, less jerky, and feel myself working better with the dogs instead of being the person who just happens to be skiing and/or getting pulled behind them. There’s a balance that I’ve struggled to find: If the dogs outpace me, they’re doing all the work; I just stand on those skis, get pulled, and enjoy the ride. If I outpace the dogs, it’s little more than a fancy walk. I admit that we’ve largely erred on the “dogs outpace me” side of that equation, but this week for the first time I felt like we really fell into a coordinated rhythm where we were matching each others’ paces and sharing the work evenly. Part of the difference was the dogs holding a nice steady pace. Part of it was a combination of more confidence in my skiing and actually getting better at skiing. But a large part of it was just… letting go of the fear of things going wrong, going too fast or falling or missing a turn or not being perfect. It’s hard for me to describe the difference in how it feels, skijoring like this with everything balanced and coming together. It’s a bit like having superpowers; each stride feels like it is drawn out forever, supercharged by the dog power in front of you. At the same time, it’s a bit like not moving at all. I know it won’t be like this every time, and that’s ok. Because knowing that kind of balance is out there and we’re capable of it gives us something to strive for, to enjoy on the days we achieve it and to remember on the days we don’t. 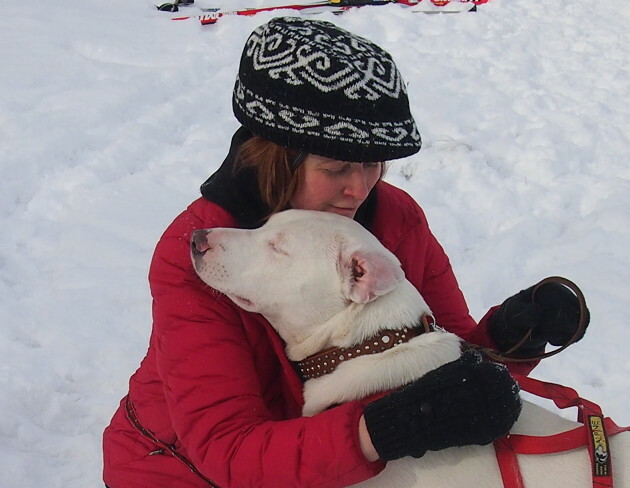 ps I found this picture of Squash coming in for some pre-race snuggles when I was sifting through my Loppet pictures again. Best boy. This entry was posted in Skijoring. Bookmark the permalink.